I first learned to ride a bike as a kid, riding a Schwinn Pixie, complete with a basket and the streamers on the ends of the handle bars. I rode that around the neighborhood, to school and even to the pool. From there, my next bike was a Schwinn Varsity, a 10 speed. I was moving up in the world! But my riding dropped off over the years. Other than a brief period of time where I rode my bike to work, I was not much of a cyclist. That was more of my husband’s interest. But as I mentioned in Part 1, I eventually moved from being his cheering section and support to entering in the triathlons myself. This meant I had to embrace cycling. Luckily, Roger was very enthusiastic about this, helping me find good bikes and riding with me while I learned so much more about the world of cycling. but changing jerseys, making dinner reservations, plotting to out-maneuver their competitor at the next hill, and either mobile banking or playing Angry Birds. All this, usually without major incident (crashing). Yeah, that’s not me. I started out klutzy and timid. Trying to add in anything other than staying upright is nerve-wracking for me. Things get dropped, I tip over, the potential for disaster is endless. But to race, I needed to learn how to eat and drink without pulling over alongside the course. I started with the simple bottle cage on my frame and a water bottle. If a person is going to spend more than an hour at any given time on their bike, they’ll need to either plan their route around water stops or carry water with them. If they’re spending even longer, they may be considering both how much to carry and where to refill along the way. There is a lot of variety in the bottle cage market. They can be mounted on the front or back of the frame, on the back of the saddle, or on the aero bars. The speedfill bottle on the aero bars is my favorite. I have less opportunity to drop things. Some people will install tanks in place of bottle cages. Depending on your needs, you can end up with multiple bottles stowed on your bike, with varying degrees of accessibility. Experiment with different configurations to see what works for you. I think many riders are Mixologists at heart. Sure, for the short rides, water is the best thing to carry. And even for the longer rides, at least one bottle is likely to be just plain water. But many riders are using their liquid not just for hydration, but fuel (carbohydrates) and electrolytes. This is so that they don’t have to negotiate handling food and maintaining a high speed (or at least forward motion). So for rides longer than an hour & a half, they may be using a sports drink or mixing a sports powder into their water. The advantage to mixing your own is in controlling how much you are taking in. This works well if you are also consistent in how much you will drink over a fixed period of time. I will admit, I have found that I don’t drink as much as I think I should. And in races, if I try to take in too much of the sports drinks when I’m pushing myself hard, my gut starts to get miserable. So my coach worked with me to change my hydration and fueling strategy, mostly on the bike. For starters, she weaned me off of the carb-based sports drinks. Only water in the bottles, most of the time. When I need energy, I use honey and a goopy mixture, made from real food and packed in a squeeze bottle. I was surprised how well that met my needs and I have very few gut problems in races or training these days. Now, the only thing that I mix into the water bottles (Mixologist at heart) is plain coconut water at a 4:1 ratio, and for very hot days, an electrolyte supplement. The theory is that the coconut water adds a bit of electrolytes to my water without adding unnecessary carbs. I’ve found that it makes the water feel more slippery, which is an interesting effect. And if it helps that ‘interesting’ means I drink more, that’s just a bonus. For race day, you need to determine whether you will carry water or rely on the aid stations to provide water. Or both. So you should plan ahead. The best rule is ‘Never try anything new on race day!’ Find out where the aid stations will be located and what they will offer (besides water). If they are offering food, gels or drinks that you have not tried in training, you would be best off carrying your own mix. Or, if you research this far enough ahead of time, try a training ride using the same fuel that will be available on race day. You may find it works well, which means you don’t have to carry extra stuff on the bike. Or you may find that the stuff tastes awful or causes your gut to feel bad. In which case, you really don’t want to find this out on race day. If your race is short enough, carrying your own fuel and water means you don’t have to slow down going through the aid stations. You do still have to pay attention and avoid collisions in these areas, as there could be a lot of people merging back into the road after their stops. 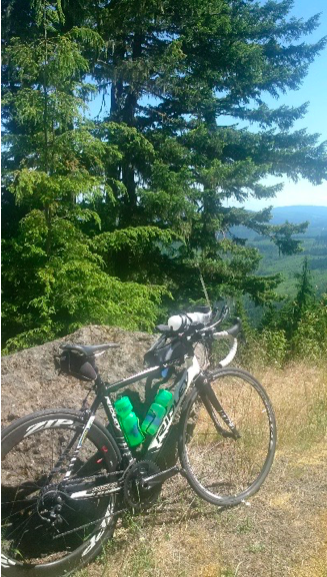 For me, even a half-iron (56 miles) is short enough that I can carry all the water I’ll need. Because of that, I never had to learn how to grab a water bottle from a volunteer while riding by on the bike. At least, not until this summer when I completed my first Ironman. There was no way I was going to carry enough water to get me through 112 miles! Even with switching out all of my bottles at the Special Needs stop, that was a risky plan. But since I was not going to use the sports drink available on course, instead relying on mixing water & coconut water, that meant I had to plan out exchanging bottles at the aid stations. I still hadn’t practiced grabbing a bottle on the fly, so I figured that I would have to learn on race day. Luckily, I’m not quite as klutzy as I was when I first started cycling. I can get a bottle out of one of my cages and (usually) get it back into the cage without dropping it. I can refill my speedfill bottle while still riding, if I am on a reasonably level stretch of road. So the only part of the hydration strategy that I would need to figure out was the bottle exchange; tossing the empty and taking a full bottle from a race volunteer. I started the day with my speedfill bottle mixed with water, coconut water & electrolytes, a full bottle of coconut water in my rear frame cage, and an empty spot in the front frame cage. This empty spot would be filled with a water bottle from the first bike aid station. I started with an empty spot simply because I didn’t want to toss one of my own water bottles at an aid station. From there on out, I could choose to refill the speedfill bottle from both the plain water and the coconut water and add electrolytes as needed. I mentioned that it seems that cyclists are Mixologists at heart? Well, here I was, planning to practice my Mixology on the bike, at speed even. As race day hydration plans go, it wasn’t horrible. In fact, there was a lot that went well with it. Looking back, I have to laugh at some aspects of it though. I had spent a fair amount of my training preparing for hot weather. But it turned out to be an incredibly cold and soggy day. I probably did not need to use as much of the electrolytes as I’d planned for. And staying hydrated meant that it seemed like I had a lot more porta-potty stops than usual. Also, because of the cold, I didn’t trust my coordination to be able to grab a bottle from a volunteer while riding. So I did like many other riders around me and pulled up next to a volunteer, coming to a complete stop before taking a bottle. However, I found that I could successfully grab bananas on the move, and by the time I reached my last bottle exchange, I did manage a slow motion rolling handoff. Victory! This was my first Olympic distance race. I learned to use aero bars 2 weeks before the race because I was so klutzy I kept dropping my water bottles. For the most part, this just barely scratches the surface when thinking about all of the intersections of water and cycling. There is certainly more to explore on the subject. But my next post will move on to thoughts on water and the final leg of the triathlon – the run. In the meantime, assuming that at least part of the time you are using tap water during some of your rides, you can check your water quality with a water test kit from Hope2o. The kits are easy to use and the reports are in a very readable format and identify a large number of analytes, grouped into basic categories. Based on your results, you may choose to add filtration to your water source. And then, get out there and go for a ride. Don’t forget your water! Colleen is a system control engineer with strong project management background. She is a classically trained musician who plays in the Everett Symphony and in her spare time she competes in triathlons and is an Ironman. Colleen is currently training for her next Ironman competition.